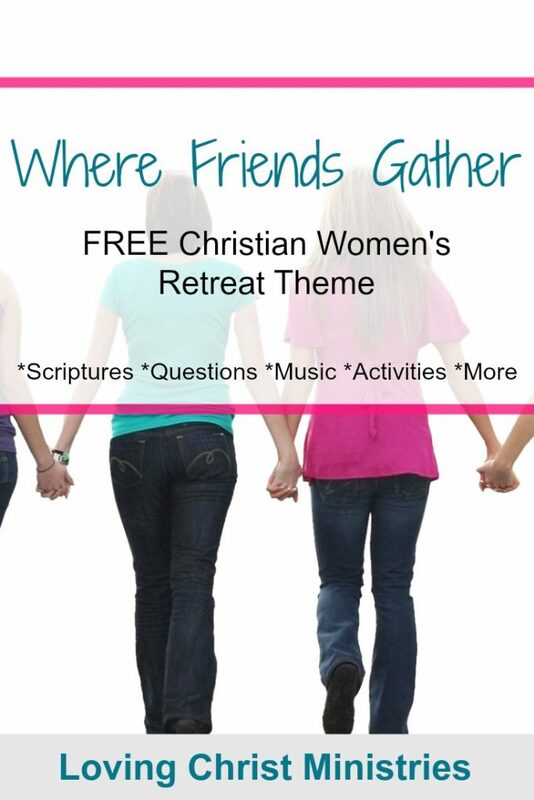 Welcome to one of our free Christian women’s retreat theme ideas, Where Friends Gather. In this post, you’ll find thoughts, ideas, recommended scriptures, activities, songs, and more. Feel free to use the ideas you need and leave the rest…or use them all. 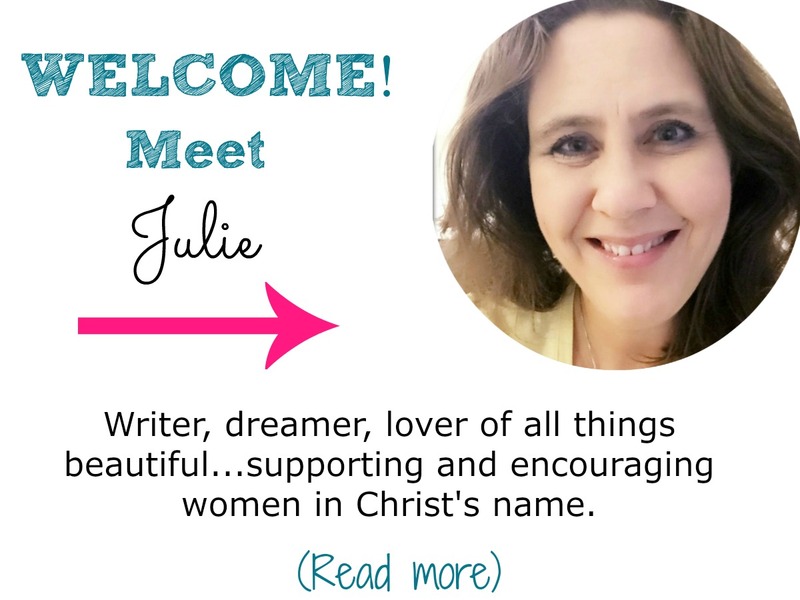 🙂 As always, if you have ideas to add, please comment in the comment section below the post or send an email to julie (at) lovingchristministries (dot) com. Friends are such a monumental blessing in our lives. The focus of this retreat is to take the time to acknowledge those friends who have made a positive difference to us. Another goal is to also realize how we can impact others with our friendship. 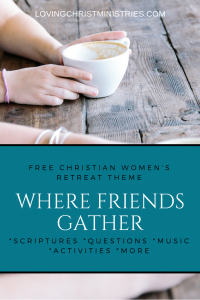 After renewing our spirits with the reminders of the joys that friendship can bring, we can take that home with us and put God’s love into action. Proverbs 27:9 Perfume and incense bring joy to the heart, and the pleasantness of a friend springs from their heartfelt advice. 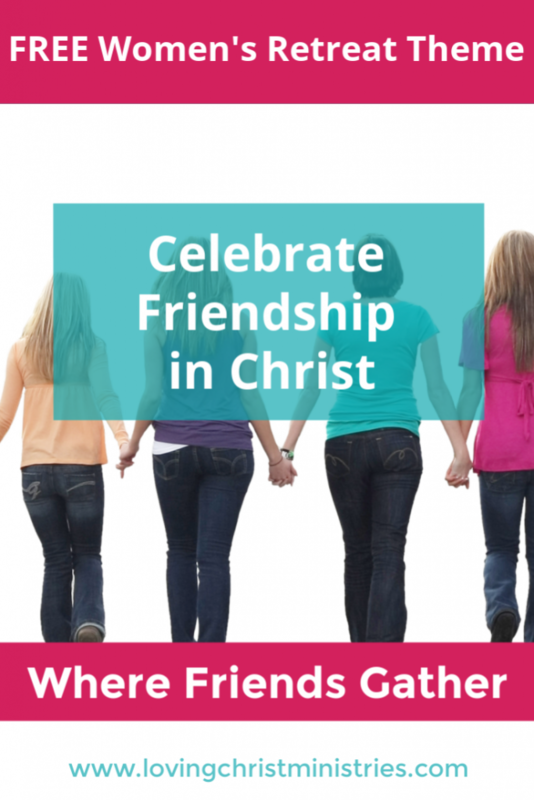 Find more scriptures about friendship in the post 20 Bible Verses about Friendship. 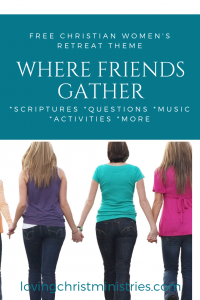 You can get a free download of all 20 verses. Use the If I Were Icebreaker from Icebreaker Ideas to warm-up the crowd, get them sharing, and help them begin to focus on the theme. (P.S. 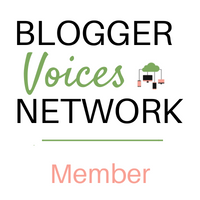 You’ll find many more great icebreakers on that site, too). Think of a special friend who has impacted your life and summarize a little bit about that person and something that person has done to enhance your life. Have each person count off using numbers one through four. Using the corners of the room you are in, have the ‘numbers’ move to their appropriate designated corner. Ask each group to select a ‘leader’ and then provide that person a pre-planned list of questions regarding the meaning of friendship to discuss and answer. 1. What makes a ‘good’ friend? What makes a ‘bad’ friend? 2. Think of a time a friend has hurt you. How did you respond? Was the situation resolved with a positive outcome or not? Share if you feel comfortable. 3. Have you ever hurt one of your friends? What long term effect did it have on her/him? On you? How can you improve as a friend? Have everyone come together to prepare this jar of yummy tea for a special friend in their life. Provide blank cards and a variety of decorative items to prepare greeting cards for the attendees to take home and give to friends. Want to remember this? 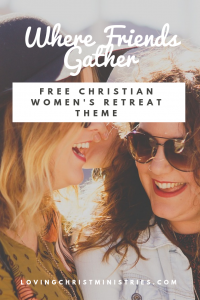 Post this Where Friends Gather Women’s Retreat Theme to your favorite Pinterest board! Hi Julie, fantastic article and thanks for including our post on Speed Friending! It truly is a fun way to get to know people quickly. I’ve enjoyed playing it as well as hosting it.